A low carb high fat (LCHF) diet is a way of eating that maximizes the body’s natural ability to access one’s own fat-stores for energy. Fat takes the place of carbohydrate as the preferred source of energy, so most of the body’s energy needs comes from a wide variety of healthy fats. A low carb high healthy fat diet minimizes carbohydrate-based foods, has a moderate amount of protein and has a high amount of healthy fats. We use the dietary fat that we eat and our own stored fat for energy and by keeping carb intake low, insulin levels are allowed to fall, which in time makes our cells more sensitive to it. As insulin levels fall, so does hunger – so we eat meals when hungry, until we are no longer hungry – but are no longer hungry every few hours. 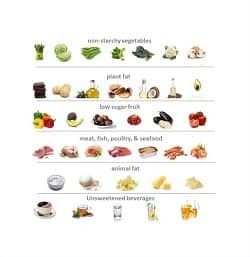 The exact ratio of macronutrients in your diet (i.e. grams of carbs, fat and protein) will differ depending on your age, gender, activity level, current body composition as well as any health conditions or medication you may be taking. A low carb high healthy fat diet does not have unlimited amounts of animal protein, although some variations of this style of eating do. There is a reason for this. When carbs are reduced, the body can synthesize glucose from protein (through a process known as gluconeogenesis), so if you eat too much protein, it can slow down your body’s transition to burning fat stores, for energy. The type of low carb high healthy fat diet that I encourage, provides sufficient protein for our body’s needs based, but not excess. One thing all low carb high fat diets have in common, is that they are lower in carbs than the conventional low fat calorie-restricted diet and high in fat. People often ask me “isn’t saturated fat ‘bad’ for us?’, without realizing that ~80% of the saturated fat in our bodies is actually made by our body, and only 20% comes from diet. If it was that ‘bad’ for us, why would our bodies naturally manufacture it? The questions often follow as to how much saturated fat should we eat? What about polyunsaturated fat? Monounsaturated fat? Eating a diet that is high in carbs while eating lots of fat, including saturated fat is a concern, but eating a diet rich in saturated fat while eating low carbs is not inherently detrimental. According to Phinney and Volek (The Art and Science of Low Carbohydrate Living), when someone is adapted to eating a low carb high healthy fat (i.e. are in “fat-burning mode”), saturated fats do not raise LDL cholesterol. That said, why eat only saturated fat? Eating a wide range of healthy fats from a variety of natural sources provides our bodies with all the essential fatty acids we can’t make, as well as provides us with foods that can reduce inflammation. I recommend that people look mainly to plant-based fats such as those found in avocado, olive, avocado oil and coconut oil (which is largely made up of medium chain triglycerides that is processed through the lymphatic system rather than the liver), nuts and seeds as well as omega 3 fats found in fatty fish for the bulk of their fat sources, beyond the saturated fat that is found in their protein sources. Nuts and seeds, including almonds, walnuts, pumpkin and sunflower seeds, pistachios etc. contain carbs – ranging from ~1.5–4 grams net carbs per ounce (30g). Cashews which are actually fruit not nuts, are the highest in carbs, ~ 7 net grams per ounce (30g) but more importantly, since nuts are high in omega-6 fats (which are pro-inflammatory and compete for binding-sites with the omega-3 fats from fish) I recommend that these be eaten in portioned quantities – such as added on top of a salad or a handful with a meal. Chia and flax seed are approximately 1–2 grams net carbs per 2 Tbsp (50 ml) and are excellent sources of both soluble and insoluble fiber. All fats on the meal plan are healthy – which is why I call this approach “low carb high healthy fat”, but for a small percentage of people for whom high LDL cholesterol continues to be a concern, eating less saturated fat may be beneficial. Each person’s needs and familial risks are different, so no one low carb high healthy fat Meal Plan is the same. Carbs are a healthy part of the low carb high healthy fat diet, but excess carb is minimized. There are naturally-occurring carbs in non-starchy vegetables and low-sugar fruit (such as lemon, lime, eggplant, cucumber and tomatoes) and berries, as well as those found in nuts and seeds – and these are not restricted. headaches: often a result of eating too little salt. As insulin levels fall, so sodium is excreted by the kidney in urine. The drop in sodium results in the headache. Taking 1-3 gms of salt per day (I prefer sea salt) will alleviate this. If you are taking medication for high blood pressure, be sure to check with your doctor before making any changes to your diet. “Bone broth” is another way to restore electrolytes that are lost as insulin levels fall. Be sure you’re drinking plenty of water and also consuming enough salt/sodium. sleep disruption: often a result of needing to urinate more, but sometimes experienced when people of switching from being in “carb-burning mode” to being in “fat burning mode”. Some people find taking some magnesium (with calcium) before bed helpful. digestive changes: some people find they get slightly looser stools or get slightly more constipated when starting. I can help troubleshoot this with you to get things back on track. aches and pains: some people feel a little achy and almost flu-like for a few days when they are switching fuel sources. Some people call this the “keto-flu”. Making sure to have a balanced amount of sodium/potassium and calcium/magnesium as well as taking extra omega 3 fatty acids is helpful. As a Dietitian, I make sure that you understand the effect that following a low carb high healthy fat diet can have on your body. If you are taking medication for high blood pressure (hypertension) or to lower blood sugar, I’ll ask you check with your doctor before starting, as blood sugar and blood pressure medications may need to be adjusted lower, as insulin levels fall. If you aren’t taking any medication, I’ll help you transition into understanding that fat in and by itself is not ‘bad’ and that eating good quality healthy fats, nutrient-dense carbohydrate-containing foods and high quality animal protein is part of a healthy diet that will enable you to feel better, lose weight and lower insulin resistance. I’ll design your Meal Plan so that it is adequate in macronutrients (protein, carbohydrate and fat) as well as micronutrients (vitamins and minerals – especially Calcium, Magnesium, Potassium, B-Vitamins, Vitamin A, Vitamin D, Vitamin K and Vitamin C) and sufficient in soluble and insoluble fiber – suitable for your age, gender and activity level, and that factor in any diagnosed medical conditions you may have. I’ll make sure that you are eating sufficient food in each of the food categories to meet your dietary needs, while adjusting for weight loss, if that is also a goal – so that you can just focus on eating healthy, ‘real food’. Feel free to send me a note using the form on the Contact Us tab, above. Note: Everyone’s results following a LCHF lifestyle will differ as there is no one-size-fits-all approach and everybody’s nutritional needs and health status is different. If you want to adopt this kind of lifestyle, please discuss it with your doctor, first. Copyright ©2017 BetterByDesign Nutrition Ltd. LEGAL NOTICE: The contents of this blog, including text, images and cited statistics as well as all other material contained here (the “content”) are for information purposes only. The content is not intended to be a substitute for professional advice, medical diagnosis and/or treatment and is not suitable for self-administration without regular monitoring by a Registered Dietitian and with the knowledge of your physician. Do not disregard medical advice and always consult your physician with any questions you may have regarding a medical condition or before implementing something you have read in our content.